Review: I'm not sure how to start this review. I read this book about a month ago and initially disliked the book, then thought maybe I was being to harsh and it had it's good points, and after thinking about it, I'm giving it 2 stars (which I still think is generous). In Allegiant, Tris, Four and a few select others go beyond the fence to see what is out there. They find out everything they learned in the video was a lie and they learn how they got there: The government decided to manipulate genes to remove the qualities of selfishness, etc. and not shockingly, this plan backfired. So they decided to 'fix' this problem but recruiting people with 'defective genes', wiping their memories and putting them in enclosed cities until they started reproducing children with normal (Divergent) genes. This had been going on about 8 generations in Chicago by the time Tris left (I couldn't help wondering why there wasn't any inbreeding issues). 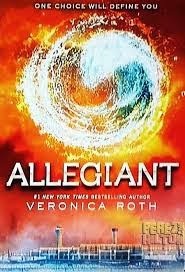 This book was told in alternating narratives with Tris and Four. It was ridiculous they were even a couple anymore and adding Four's narrative was unnecessary. He came off as extremely emotional, indecisive and weak. Tris was her normal self sacrificing self. My biggest challenges with this book were the lack of characterization for secondary characters (i.e. Christina, Uriah, etc) and the plot holes. Several characters die in this book and I could barely muster any feelings for them (excluding a major death at the end, which I won't spoil but will say I'm probably in the minority for being okay with their demise). And the plot holes....wow, there were a ton. The world building was lacking, many things weren't clearly explained, the resolution at the end didn't really make sense and characters actions were out of place. I'm avoiding spoilers here people but this book was all over the place. My least favorite of the series. I didn't hate it but it I didn't quite like it either.